Thanks to the fact that Pinellas County high schools release early on Wednesdays, Catherine Nothstein didn't even have to skip school to watch the live feed of the Apple iPad announcement on her home laptop. Glued to the screen, this ninth grader from Dunedin High School in Dunedin, FL, was among the millions who got a first glimpse of the revolutionary new gadget at shortly after 10 a.m. Pacific today. While the iPad's capabilities wowed Nothstein, a long-time iPod and MacBook fan, her initial feedback came with a hint of disappointment: "I can't believe they made this without a camera," said Nothstein, who recovered quickly after watching Steve Jobs point out all of the device's functionalities. "But oh well, the apps and the touch screen look pretty cool." When asked about the impact that these devices might have on her education--either in or out of the classroom--Nothstein answered, "Well right now we don't really even use laptops in the classroom, so something like this would be a big improvement." The fact that ninth graders like Nothstein are somewhat blasé about a device whose heavily anticipated launch attracted millions of eyeballs around the world isn't exactly surprising. Call them jaded, but today's K-12 students have the world at their fingertips when it comes to technology, and are only limited by budget when it comes to getting their hands on items like Apple's new iPad. K-12 teachers are a bit more impressed by the cross between the laptop-iPhone hybrid, and told us it could go a long way in helping to connect educators with their students. Barbara Wippich, a self-proclaimed "digital immigrant" whose grandchildren chastised her over the holidays for wanting to "read" the Nintendo Wii console directions before jumping into game play, said she knows firsthand just how "hardwired" today's students are for digital connections. "Change is happening so fast, and this kind of [technology] is in most of our kids' hands already," said Wippich, curriculum and instruction intervention coordinator for Liberty Public Schools in Kansas City, MO. "The sooner we in the education field start to embrace it and use it, the better off we'll be." Ashlee Ritzko, a fourth-grade inclusion teacher at Homestead Elementary School in Crossville, TN, said the iPad definitely has a place in the classroom, but with the devices set to launch at $499 to $829 apiece, she said she worries they could be cost-prohibitive. "The notebooks we're using now costs about $150 each, but the devices don't allow for Web access," said Ritzko, who said she sees Internet access as a key advantage for iPad users. "The more that kids have access to the Web and other applications, the easier it becomes to teach them." As an educator, Ritzko said she would consider purchasing her own iPad to replace the $1,200-plus MacBook that she currently uses in class "I personally wouldn't buy a $1,200 laptop for the classroom, but it sounds like the iPad would not only be useful and portable, but also more affordable," said Ritzko. "The device's touch screen would be excellent, especially if I could hook the iPad up to my projector. It would make classroom presentations much easier." Like Nothstein, J. Gerry Purdy, was also glued to his computer screen on Wednesday afternoon, only he was watching the Apple announcement from a different angle. Based in Wellington, FL, this principal analyst for MobileTrax said he was not only enthused at the introduction of the hardware itself, but also by the iPad's potential as a new publishing and development platform. Making the iPad different--and perhaps more useful within the educational field--from other handheld devices, said Purdy, is the fact that it has its own software development kit. "The iPad runs on the core iPhone operating system, but it is truly a new platform with more screen real estate and more memory and storage space," Purdy explained. "This will allow a whole new class of gaming and educational apps to come to market." Textbooks, for example, may look and feel very different in a just a few years, thanks in part to the introduction of the iPad. "We'll no longer be thinking in terms of static publications and will instead be using dynamic content with animation, movies, video, and other multimedia built into it," Purdy predicted. "We'll go from trying to feed PDF textbooks into portable devices to building interactive, dynamic applications that students can carry around with them." 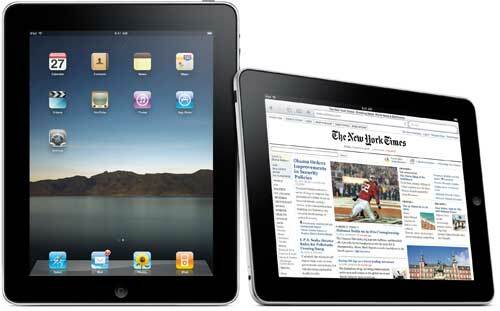 Comparing today's introduction of the iPad to the 2007 debut of the iPhone, which at the time was not associated with a burgeoning app store, Purdy said educators should view the new device as more than just a new piece of hardware. "This is really just the beginning," he said. "Just watch what creative developers are going to do with this platform. It should be pretty exciting."